In 1860, when Regina Shober Gray began keeping her diary, gift-giving was spread between Christmas and New Year’s Day: indeed, the latter day was the more important of the two in the eyes of the Gray children. For at least the period of the Civil War, the Gray family of Boston impatiently awaited the arrival of “the Philadelphia box” – containing presents from Mrs. Gray’s siblings – with shipment timed for the days around January 1. Boston, Friday, 27 December 1861: Our Christmas dinner went off well. Only Mrs. Gray, Annie & Fred. The children had a small tree, on which were hung all their own presents to each other, consisting of card photographs, pocket gimlet, jews’ harps, tapemeasures, rebel-scrip, stamped envelope[s], &c – also some things Fanny sent over, and a few bon-bons. It looked quite pretty enough to delight them on Xmas morning, especially the Santa Claus, which Mary [Gray] dressed in cotton-flannel ermine! and tied to the topmost bough. The children each gave me a card photograph. I gave Frank 25 of “Prang’s celebrities” – all that are published in addition to those I got him in Philad[elphia]; to Mary a wrought pocket hdkf. ; to Sam 100 envelopes for his collection; to Rege a book and Morris a toy gun. The New Year’s box arrived from Philad. yesterday full of charming things – a sachet for Mary, in which lay an exquise Brussels lace head-dress for me from Mary & Lizzie, and a lovely hdkf. wrought in crimson from Sue & a smaller one for M.C.G. – and Sallie sent me a pair of slippers & M.C. the loveliest Marie Stuart hood – Am Mai giving the sontag & Sleeves to match. Frank [Gray] had a picture for his room and a taper case of Chinese jed-stone – and [the] Darley edit. of the “Last of the Mohicans” from Mrs. Shober, who sent Mary sleeve studs – and Sam “Plutarch’s Lives,” to his great delight. 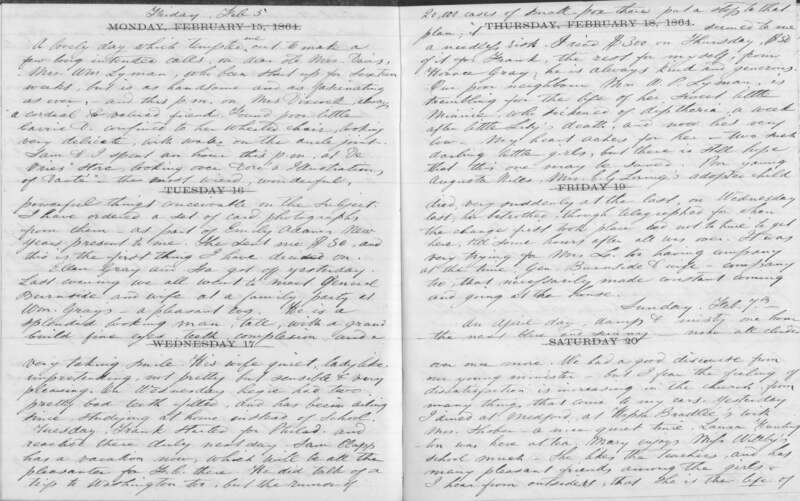 Sunday, 21 December 1862: Yesterday p.m. I shopped for Christmas presents, commissioned by Horace Gray; my own have been bought sometime [ago], we succeeded quite satisfactorily. I found three very nice japanned dressing cases for the three girls at no. 20. A good game for Edward – nice bibles for my Mary and Morris – English ones – Morris illustrated, Mary’s brass bound with clasps. F.C. will get a handsome pair of skates with his 10 dollars – and the other children’s I shall look after tomorrow. By the end of 1863, household worries were mounting in Philadelphia: indeed, Mrs. Gray’s brother John would die in 1864, and their sister Elizabeth in 1865. 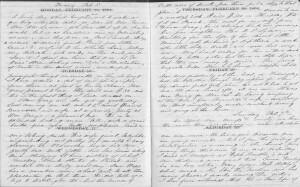 Thursday, 31 December 1863: My letters from Philad. are very sad – and give little hope of being other than sad, at any time. No one knows the trials, anxieties, sufferings, & worries hidden under the smiling faces and genial manners of that darkened household. Nor can any thing be done to ease those anxieties or avert those worries. Ah me, it seems a mockery even to say the common salutation of the season to them – I know their Christmas cannot be merry, nor their New Year happy – God help them! Sunday, 18 December 1864: Regie has amused himself this week by taking casts in sulphur and in plaster of Paris from some medals &c, with very good success. But the sulphur had to be melted over the nursery fire, and consequently we seemed to breathe the fumes of the bottomless pit! Sunday, 8 January 1865: We hear good accounts from dear Regie. His cough scarcely troubles him at all – and he is very happy. They are doing tout leur possible to make him contented. A gymnasium and workroom are fitted up in the attic for him, the yard is flooded nightly for his slides. His boy friends are allowed to come in and romp with him – often, I fear, to the distress of aching heads and the detriment of the usually quiet & orderly household &c – altogether he seems to be in clover, and will we hope to be content to stay, long enough to be much benefitted. And with all the turmoil he makes in the house, yet his aunties are delighted to have him, and his visit will cheer them a little & do good to them as to himself. We miss him so much here. The children say it seems months since he went. Hedwiga Regina Shober (1818–1885) was married to Dr. Francis Henry Gray of Boston 1844–80. The diarist’s unmarried brother and sisters shared a house in their native city of Philadelphia. Possibly misdated for 26 December. Dr. Gray’s first cousin Thomas Carolin Clay (1841–1897). The diarist’s brother John Bedford Shober (1814–1864). The diarist’s daughter Mary Clay Gray (1848–1923) and second son Samuel Shober Gray (1849–1926). John H. Jenks had a house at 2 Mount Vernon Street in 1860. Mrs. Gray’s mother-in-law, Mary Clay (1790–1867), was married to William Rufus Gray 1809–31. Dr. Gray’s brother Frederic (1815–1877), who shared a house with his widowed mother and unmarried sisters Annie and Ellen (1830–1921). A tool used in the process of attaching skates to leather boots. The paper money of the Confederate States. Dr. Gray’s niece Frances Loring Gray (1843–1919), who married William Adams Walker Stewart in 1874. Mrs. Gray’s youngest sons, Reginald Gray (1853–1904) and Morris Gray (1856–1931). The diarist’s sisters Mary Morris Shober (1816–1873) and Elizabeth Kearney Shober (1821–1865). Mrs. Gray’s sister Susanna Budd Shober (1823–1898? ), who married Dr. John Davies of Fayal in the Azores in 1867. Mrs. Gray’s youngest sister, Sarah Morris Shober (1825–1917), who married their cousin the Rev. William Phillips Lewis in 1868. A Gray family nickname for Mrs. Gray’s sister Mary Shober. The diarist probably means jade stone. An edition of James Fenimore Cooper’s novels (1859–61) illustrated by Felix Octavius Carr Darley (1822–1888). An edition of Lives of the Noble Greeks and Romans by Plutarch (46–120). Number 20 Mount Vernon Street, home of the elder surviving daughters of William and Sallie Gray: Isa Elizabeth Gray (1841–1923), Fanny Gray, and Anna Greely Gray (1845–1932). William and Sallie Gray’s younger surviving son, Edward Gray (1851–1907). A visit meant to cheer Mrs. Gray’s sisters following the death of their brother John. Lizzie and (probably) Sue Shober. By Charles Dickens, first published in London in 1843. Published in New York in 1861. Enjoyed this post very much. This glimpse into 19c Boston was an early Christmas present for readers. This cannot have been too many decades after descendants of the first settlers in Massachusetts began to celebrate Christmas. In some places, I believe it was still rather daring. Loved reading this. It reminds me of the excitement my brother and I felt when the boxes of Christmas presents arrived from relatives in Bangor, Houlton, or Boston. Today they all seem to come from Amazon.